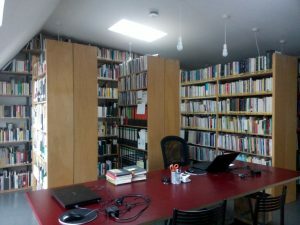 Our specialist library with a focus on Kurdistan and Kurds is the largest of its kind in Germany. It currently holds appr. 17,500 titles in the humanities and social sciences in English, German, French, Kurdish (Kurmancî and Soranî), Turkish, Arabic, and other languages. Find our online OPAC library search tool at opac.kurdologie.de. The library search is currently in its beta test phase. The library is open Monday to Friday from 11 a.m. to 4 p.m. and by appointment. It is a reference library, which means that books are for use in the library only. There is, however, a possibility to make copies for a fee and copies of individual articles can be ordered by e‑mail. We offer a research service free of charge for persons with disabilities unable to visit the library. Our Library database is currently being updated with numerous new titles. The Projects category was updated.